A couple of weeks ago Emily and I went on a bit of a culinary adventure. Bespoke Offers, a discount site run by Barclaycard (think Groupon but much better), had teamed up with Bompas and Parr, creators of crazy food and drink experiences, to host a 200 course meal over 24 hours. 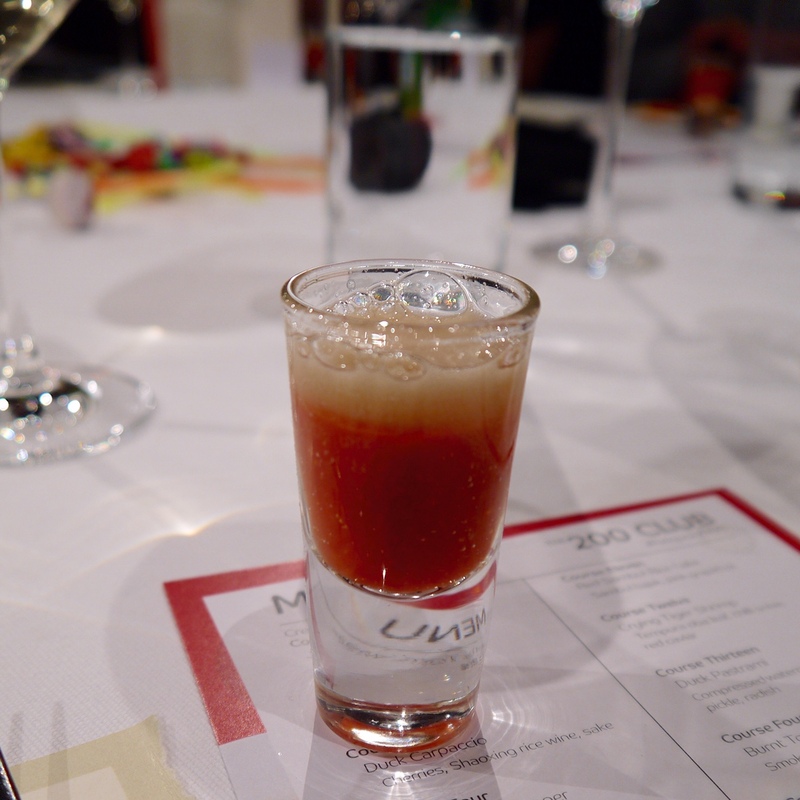 Each set of 20 courses was colour themed, so we went along for the Red Party Time session, which ran from 10-12pm. Except it didn't quite.... They were running a bit late. We arrived at the venue (which also happens to be where Dragon's Den is filmed) just before 10pm, and took a seat downstairs where our glasses were kept full and we were entertained with egg healing practice (don't ask!) and trying to chop the top off a magnum of champagne with a sword. Minutes, then hours passed, our drinks were drunk and refilled, and finally, at 1am, we sat down to eat a 20 course meal. I'll talk you through what I remember, though I won't lie, three hours of drinking champagne had me slightly blurry before we even started. 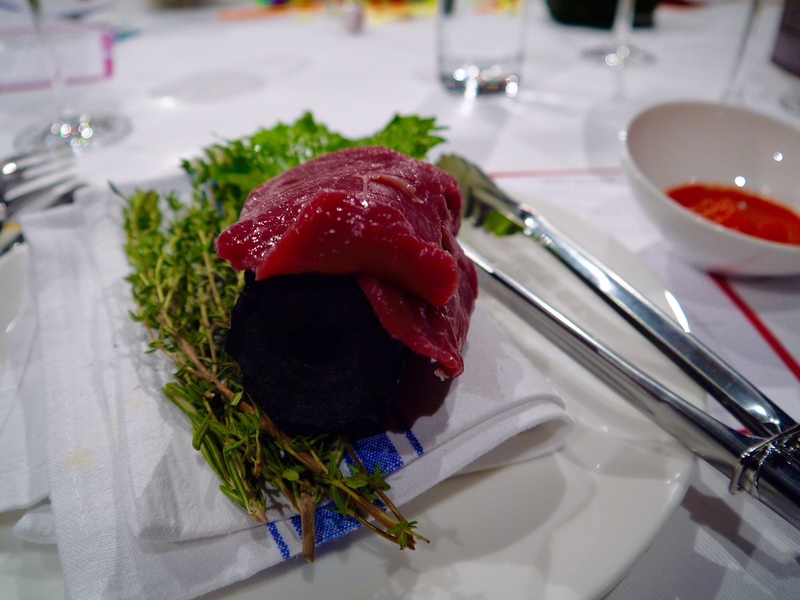 We went upstairs and joined four troupers who were in it for the long run, eating 200 courses over 24 hours. Three of them were journalists, the fourth a (un)lucky competition winner. They all looked jaded, despite the in house medics' best efforts to keep them awake and able to carry on eating. As we were there for the Red Party Time, all 20 courses were red themed. Having somewhat lost my appetite before we'd started eating (it was after midnight), I struggled to finish any of the courses, and while some of them were delicious, there were others it was easy to pass on. Also, my photos are rubbish. The whole event was being filmed, so the table was covered in spotlights, and I couldn't get a single photo that wasn't covered in shadows. But considering all the bubbles we drank, just be glad I managed to get photos at all!! And excuse the mucky tablecloth in some of the piccies, it all got a bit red! 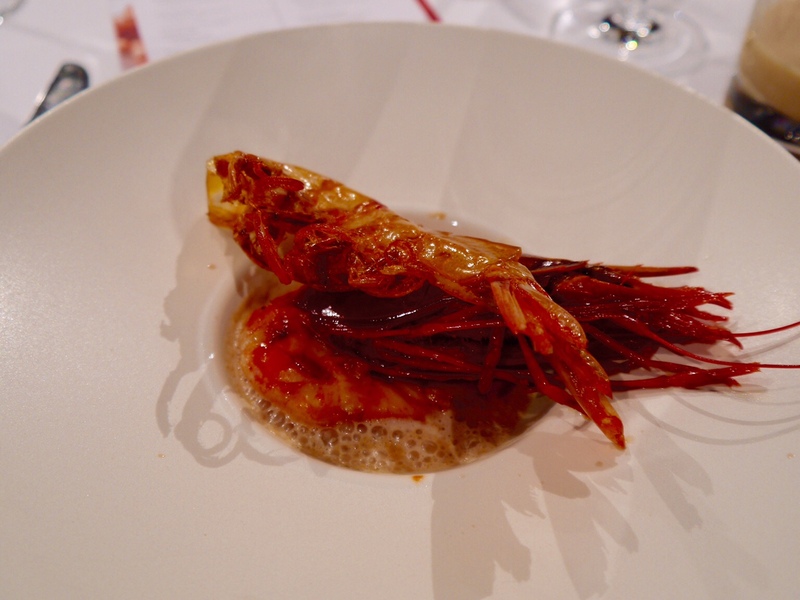 My absolute favourite dish of the night, which I did eat all of, was the carabinero red prawn with lobster stock. The chef (Tom Whitaker for this course - he cooked the first five, then Tim Yates cooked the remaining 15 dishes) had cooked the prawn meat, but also deep fried the shell of the prawn, so we ate the entire thing, and it was absolutely delicious. 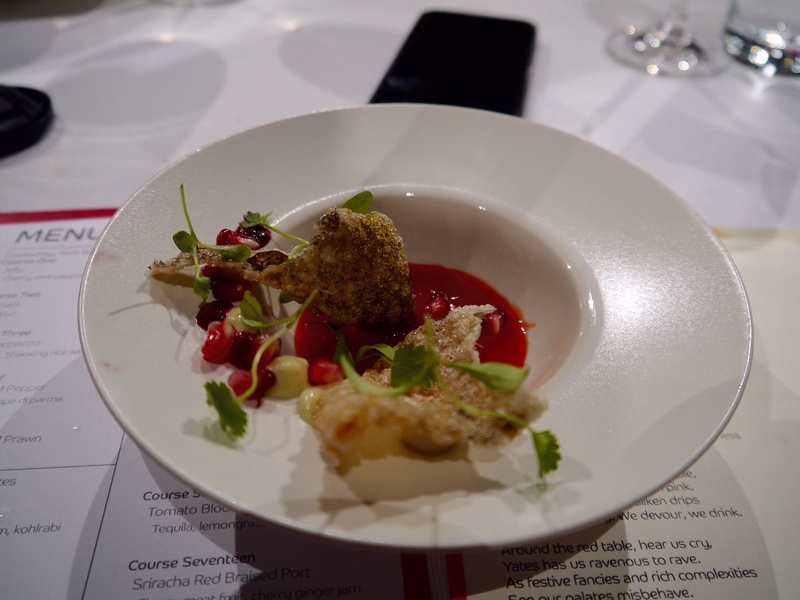 The lobster sauce was delicate and light and let the prawn take centre stage. 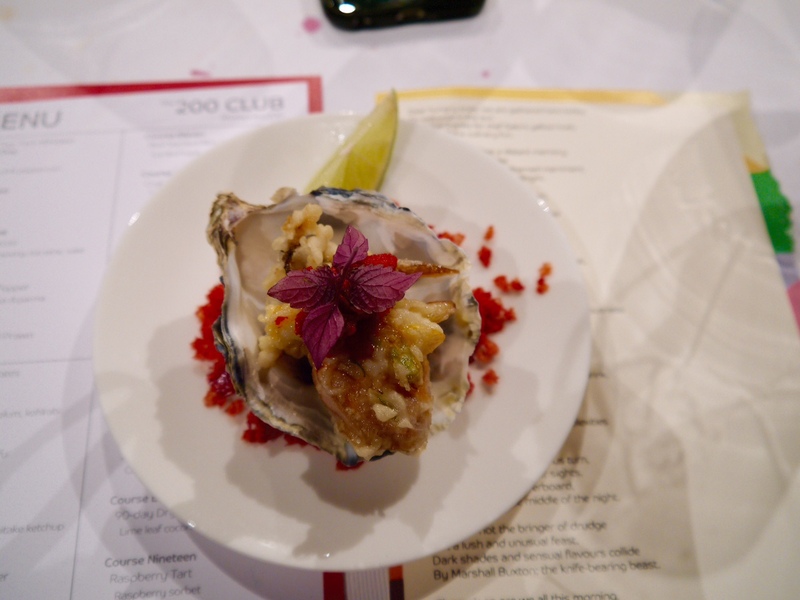 Tempura oyster with XO sauce and red shiso - I adore deep fried oysters - it takes them to a whole new level, and this one was excellent with the XO (spicy seafood) sauce. Tomato and saffron was lovely. 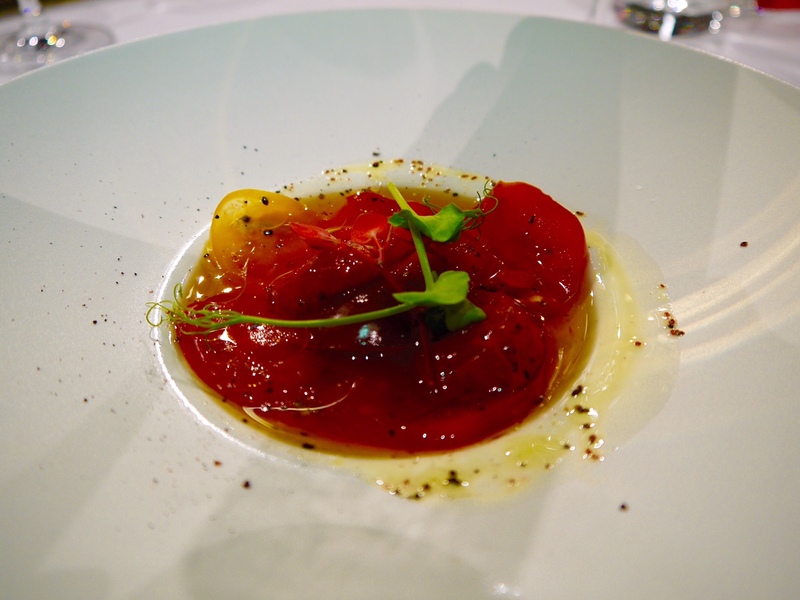 The tomatoes were the perfect ripeness, despite the fact there were quite a lot of them on a dish that was part of a 20 course feast. Duck carpaccio with shaoling wine and cherries was definitely not carpaccio (thinly sliced meat) but was still very tasty. 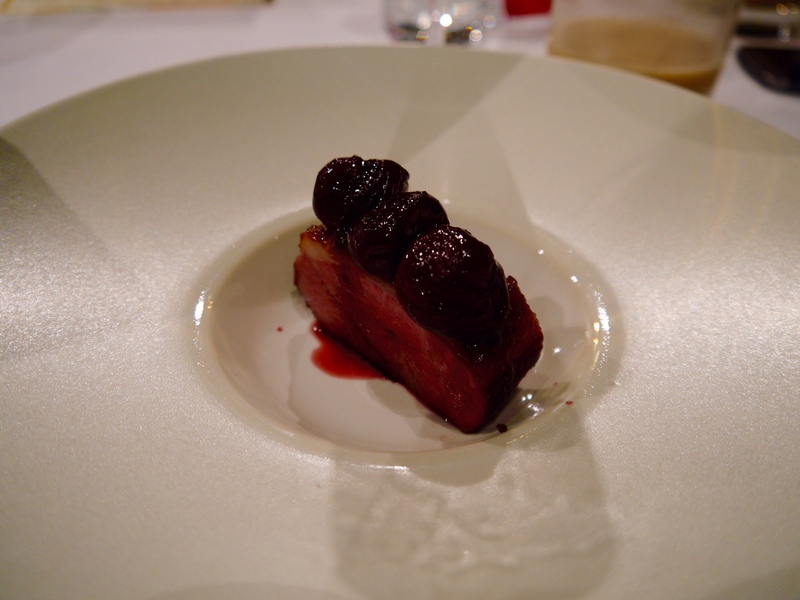 Duck and cherries is a classic combination. Not quite another dish but I loved the tomato Bloody Mary with tequila and lemongrass, mostly because as dish number 16, it wasn't another plate of food! And because tequila.... not that I really needed anymore booze at that point. 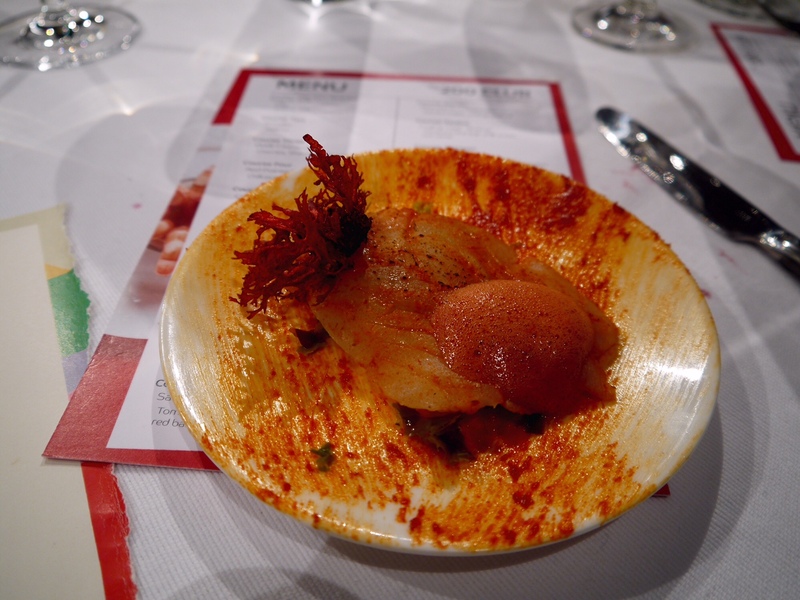 Red miso cod, red pepper dulse and pepper and coconut foam. Not a fan at all! It was sweet and odd and definitely not something I could manage so far in to the meal. Steak tartare, which was mainly not steak. I'm so proud of my own steak tartare, and honestly think it's the best version I've tried, so this was a long way off! 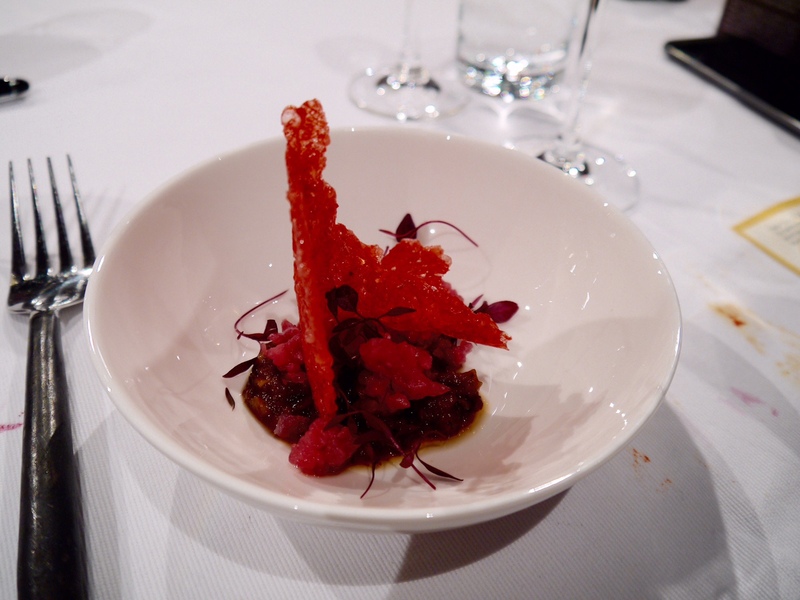 The next course I didn't really eat any of was salmon skin crackle with tomato gel, pomegranate and red basil. It was so, so sweet and the salmon skin wasn't how I would serve it - it didn't really taste of anything and would've been good to mop up the sauce with if the sauce had been worth mopping up! 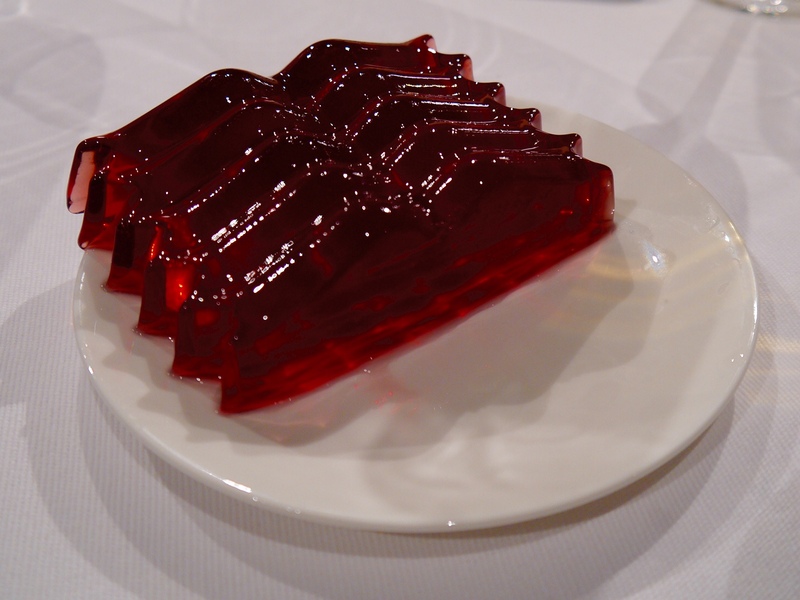 Each set of 20 courses started with a jelly. Ours was cherry and pink peppercorn. Edible, just not something I would start a meal with. 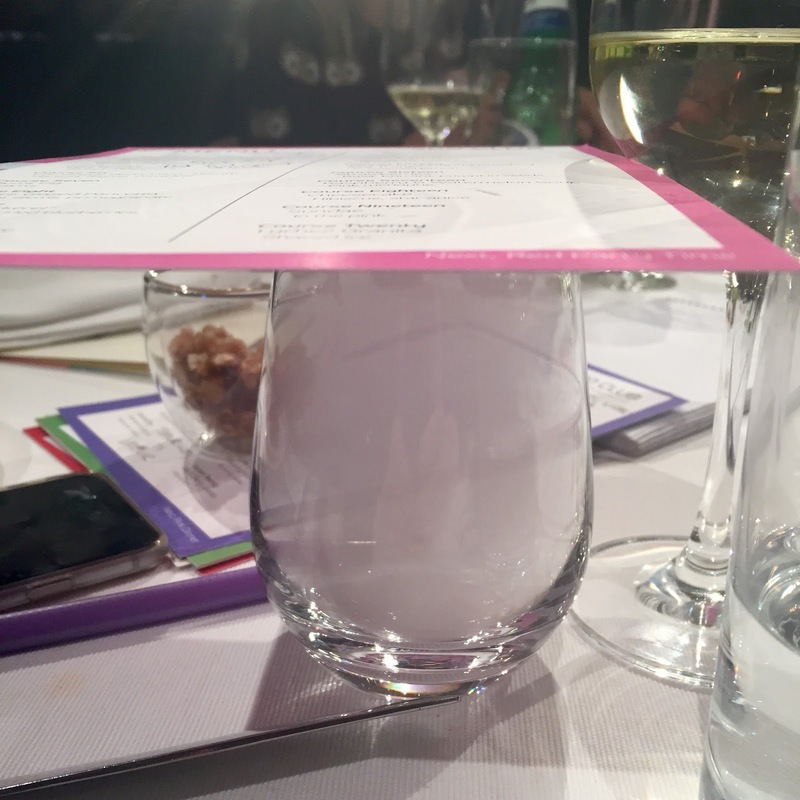 I vaguely remember this vapour being "poured" into the glasses, but don't remember drinking it! It's also not on the menu I took home, so who knows!!! 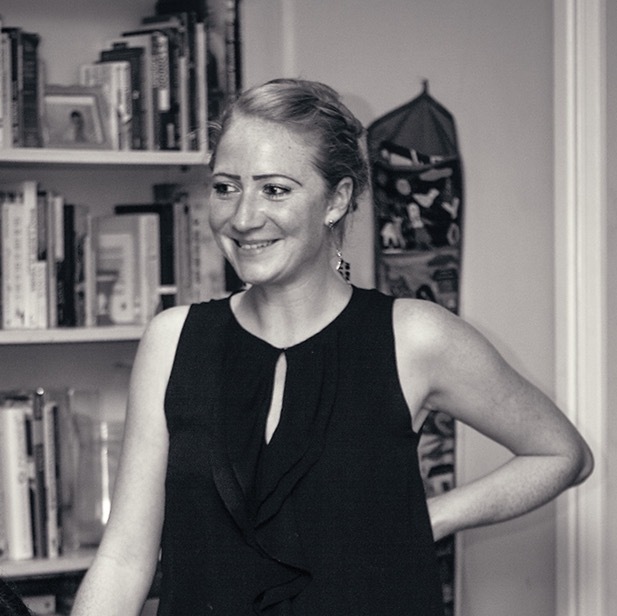 The next dish had completely slipped from my memory, until I read Emily's write up and it all came flooding back. 90 day dry aged beef was meant to be cooked at the table on a white hot piece of charcoal, except the charcoal wasn't white hot. In fact it was barely warm. There wasn't even a sizzle when we put our piece of beef on it. So out came the blowtorch and all was resolved/cooked! After all that, and being nearly 4am, I am totally excused for having limited pudding memory. 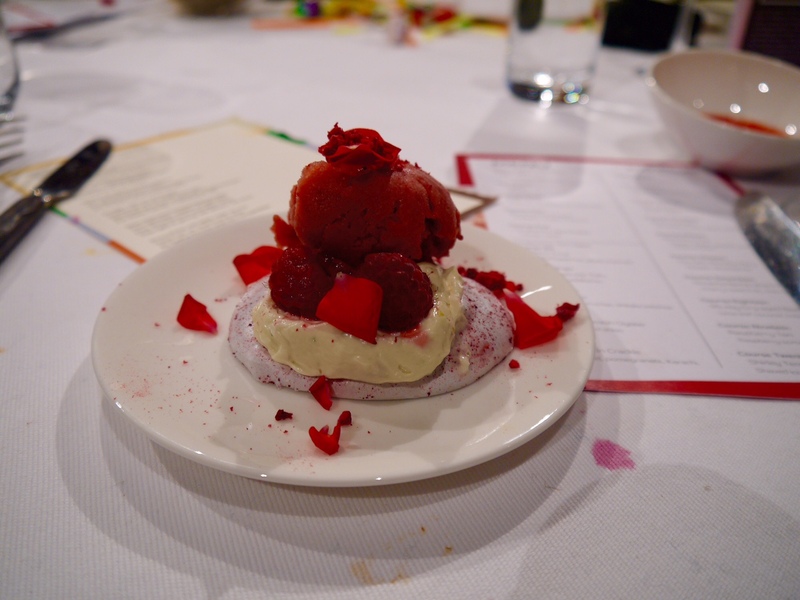 Apparently it was raspberry tart with raspberry sorbet, but who knows. I certainly didn't eat any of it. Nor did I eat any of pudding number two, a shirley temple granita that followed this. There's only so much a girl can eat (in the middle of the night)!! And with that, we jumped in taxis and rolled home. Despite its ups and downs, we had such a fun evening with Bespoke Offers and Bompas and Parr. Thoroughly entertaining, and far too much to eat and drink, but isn't that normally the sign of an excellent night out?! If you're looking for something a bit more manageable, do check out Waffle On at Watch House on Bermondsey Street, which is where we started our evening. You can get your sweet (seasonal fruit and coulis / baked plums with amaretti biscuits and cream / Belgian chocolate sauce with meringue and cream) or savoury (buttermilk chicken and maple syrup butter / Asian spiced slow roasted duck with plum sauce / goats cheese, blueberry coulis and fig) waffle fix from 5pm every day at Watch House. They cost between £5 and £8 and are worth every penny. 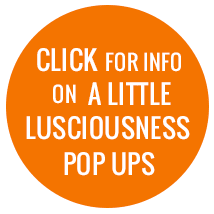 What a fab event! I would've been VERY squiffy after 3 hours of champers and I think your pics came out really well, considering! Yeh, considering.... it was all a bit blurry!! Although the food does look amazing, I can help but feel like staying up for 24 hours and constantly eating sounds like a form of torture....we they a bit delirious by the end? Very delirious Angie!! It was fun, but definitely wouldn't have wanted to do all 200 courses! Oh wow, how can people manage 200 courses in 24 hours? They're not all the smallest of servings either! You did well to still stay away enough by that time and to have gotten photos. Those waffles also look incredible, book marking to visit! 1am-4am; phwoar, you are dedicated it has to be said! Crazy night, but lots of fun! Wow - the food looks so delicious, Rosie - It's making me want to reserve a table for tonight. WOW!